We went to the lake Labor Day weekend! It seems like each time we go Jackson and Brylee become "attached" to something new! This weekend trips theme was Knee Boarding! They would have knee boarded ALL weekend if we would have let them! 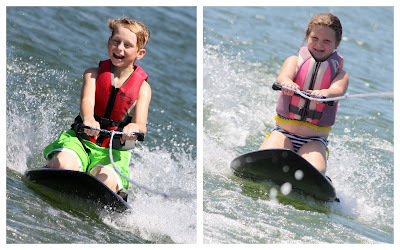 Both of them had a great time and really got this whole knee board thing figured out! also LOVED flying all the way across the boat over both wakes... silly boy! by the end of the weekend she was making it outside the wake!